** Please note Free Ground Shipping for these 12 quarts of fuel for the lower 48 states in the USA. If you add any additional items to your cart with this item, as you will only pay shipping for the additional product based on your shipping option. Also any additional products maybe boxed separate from the fuel. 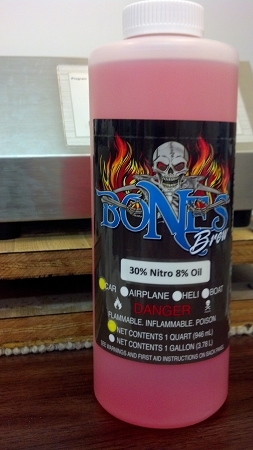 This is 12 quarts of Bones Brew 30% Nitro / with 10% Oil Package Car Race Formula. The Race Formula consists of the VP Nitro and Methanol along with a special blend of caster and synthetic oil package for the weekly racer or backyard basher. This fuel formula gives the racer great performance with excellent protection and longevity of their nitro engine.